Shari Natovitz lost hundreds of former colleagues on 9/11. Now she manages risk for a vital piece of New York’s skyline. Shari Natovitz, the director of risk management for Silverstein Properties, is a Jersey girl. She grew up in Fair Lawn, N.J., which is less than 20 miles from Lower Manhattan. Children in her family were not coddled. B-plus on your English paper? Not good enough. “You had to bring home an A,” Natovitz remembers as she spoke with R&I on the 46th floor of 7 World Trade Center in Lower Manhattan on a windy March morning. The dynamics of the house were such that the two siblings would play along, competing against one another for allowance money. The home was devoid of gender bias. “I grew up playing baseball, softball and football out in the street. My mom ran track and field, so I ran track and field,” Natovitz said. These days, Natovitz manages a $100 million-plus insurance program for one of the highest profile projects in the nation, the resurrection of the World Trade Center in Lower Manhattan. In place of the seven buildings that were either destroyed or heavily damaged by terrorists in 2001, a new set of towers is rising. Natovitz manages risk for four of them with one assistant; not to mention her responsibilities for additional Silverstein Properties holdings. Is she intimidated by the scope and responsibility of her job? No, she is not. Natovitz says she has the background and the passion to meet those challenges. Before joining Silverstein, Natovitz spent decades as a construction broker with Marsh, its predecessor Johnson & Higgins, and later with USI. It was at the conclusion of bidding on the broking work for part of the WTC rebuild — when Natovitz was the East Coast construction practice leader for USI — that Silverstein offered her the job of risk manager. “I have an extremely strong brokerage background and believe in transparency and negotiations to secure a mutually acceptable outcome. Because I grew up in the Johnson & Higgins system, it was a much more consultative than transactional approach, which was really what was needed to organize this and set a solid foundation for the transition to risk manager,” she said. The passion stems from the fact that Natovitz, like many insurance veterans, lost friends and colleagues in the inferno of 9/11. “I was a Marsh/J&H person for 20 years and left the company in late 2000, and was a part of the construction group. The construction group was meeting at the North Tower that day,” she said. Marsh & McLennan lost 295 people in the attack. “For me, it became very personal and life-affirming. It wasn’t a job, rather a mission, and a tremendous desire to be a part of and contribute to the rebuild,” she said. Managing risk for the rebuild of the World Trade Center is, perhaps needless to say, complex and demanding. When Natovitz took the job in 2005, she had several obstacles to overcome. Perhaps the most forbidding barrier was that insurance carriers were reluctant to offer cover. “What did surprise me when I got here, stunned me, were the number of markets in 2005 that did not want to do business with our company; absolutely floored me,” she said. A number of factors played into that reluctance. Discord over who should rebuild the towers and how they should be designed generated headlines in many New York newspapers. “They weren’t flattering headlines. They weren’t truthful. Not unusual in the world, but frustrating,” she said. There was also the fact that the WTC was twice a target for terrorists. First came the 1993 attempt to bring down both towers by exploding a truck bomb in a garage of the North Tower. Then there was the 2001 attack via two hijacked commercial jetliners that did bring them down. Thus, two terror attacks on one site’s loss run. “Nobody else in the U.S. had that experience,” she said. Natovitz said that going forward she and her brokerage team needed to showcase the re-engineering and security of the new structures — including life safety — that made this a different and more robust project. The coverage of the Silverstein buildings lost or damaged in the 2001 attack was also in dispute at the time and wouldn’t be settled until 2007, with a number of carriers eventually agreeing to pay the company $4.55 billion. Natovitz also began her task dealing with four different insurance brokerages. Within a year or two, banking on her own deep experience as a broker, she had seen enough to put the entire program in the hands of Willis, now Willis Towers Watson. “Willis didn’t get anything they didn’t deserve,” she said. 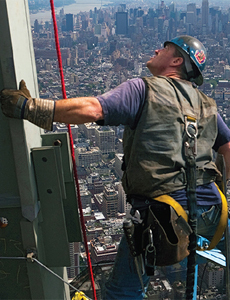 Insuring the safety of those building the World Trade Center towers ranked high in the minds of the Silverstein Properties risk management team. Natovitz said she was impressed by the way Tim Egan — a WTW senior vice president, property broking — solved problems for her on a property placement for 7 World Trade Center. “That made me feel like they were the broker who best understood the market challenges and lack of market identity and could best lead us through that,” she said. The insurance program for the operational buildings was fragmented. The coverage for each property was being placed separately, under the name of each building, as opposed to one comprehensive program. “There was no understanding of the collective premium that was being put in the marketplace. This not only affected the quality of coverage, but also the buying power,” she said. She was also impressed with the assertion that $6 billion in needed builders’ risk capacity could be developed and had confidence in the plan put together by Neil Kent, a WTW builders’ risk placement leader. A prior broker told Natovitz, a Maryland resident, that she didn’t understand the New York market (she had worked for her first 10 years in the New York market) and stated that the capacity needed to protect the project was unobtainable. A year and a half into her new position, the redesign of the Freedom Tower and responsibility for it — which formerly fell into Natovitz’s risk management portfolio — transferred to the Port Authority. Natovitz met with Silverstein Properties management to explain why they needed their “own dog in the hunt” for limited capacity. That preferred bloodhound was what we now know as Willis Towers Watson. With her WTW team, Natovitz set about creating an owner-controlled insurance program, known as an OCIP, for the construction of 2 WTC, 3 WTC and 4 WTC and a builders’ risk and terrorism program that required $6 billion in capacity, which was a hard sell. The solution to the builders’ risk capacity challenge was to break the risk into three $2 billion risks, and pull the terror and fire following risk out and put that in a captive. “We knew that $6 billion of construction capacity was not available in the market. But we knew that there was $2 billion available in the market,” WTW’s Kent said. The captive option for terrorism needed to be explained to management. Neil Kent and Tim Egan said Natovitz expects everyone that works with her to be very well-prepared. “I think she reads everything and knows everybody,” said Kent. “Her demands are very high and she wants everyone else to be prepared,” Egan said. “This is a very important project to everybody, and I think everybody feels the same way. She’s done a lot of things to bring this project to the front and center,” he said. “Certain risk managers, when you deal with them, you learn from them how they see this. I don’t think there is a better example of that than Shari in that respect,” Kent added. Natovitz and her risk management partners at WTW are also very conscious of the importance of maintaining long-term relationships with carriers. Throughout the recent coverage history of the WTC, from the terror attacks through the rebuild, transparency and buy-in from senior insurance carrier management occupied a place of utmost importance. “The key to all of this was never operating in a vacuum with the marketplace,” said Ray Blackton, an executive vice president with Willis Towers Watson. “When Shari first took the job, one of her big concerns was that her company was not really known by the markets or had a misconception of the markets. Our first plan was high-level meetings with the most senior people of the organizations before any submission ever went out on the Trade Centers,” Blackton said. There are now more than 50 carriers/carrier profit centers, including the domestic and international markets, on the Silverstein Properties program overall. “Everybody’s a key to the placement, but Lexington, Munich Re, Zurich, Swiss Re and Starr really provide a significant part of the capacity, along with XL Catlin and Chubb,” she said. Through high-stakes insurance settlement litigation, political squabbling and the flooding from Superstorm Sandy, keeping an eye on the long-term and the value of respectful relationships remained of paramount concern. “We have enjoyed a great working relationship with Shari over the years,” said George Stratts, president, property and special risks for AIG. “And as with any good relationship or partnership, it’s honest, it’s open. And one of the things that I think we have appreciated from Shari is seeing both sides of an issue. How do you see multiple points of view so that we arrive at the best answer for all parties?” he said. That came into play when there were World Trade Center construction delays. The delays meant that Silverstein was paying insurance premiums for two years when there was no exposure. Natovitz went to her brokers and asked them to approach the markets to adjust the premium for the two years without any exposure and move the term forward to represent the new schedule. “I knew this would be a difficult request, but wanted to work out a solution to continue coverage with the same carriers for the completion of the project without the financial burden of paying for an extra two years with no construction taking place. “In addition, we were now only going to build two of the three towers,” she said. “The carriers were very fair in their responses and almost one-third of the casualty program was returned, with the knowledge that the coverage would be placed with those same insurance partners down the line. We have continued the placement through 2019 with these partners,” Natovitz said. No American citizen could look out from the 46th floor of 7 World Trade Center and not be moved. The view is stunning. The human drama that unfolded over time in New York and that’s reflected in its skyline is profound. Then there is our more recent history. Brutal attacks of terrorism, grief and a remarkable recovery. “I can always say I worked on the World Trade Center project when it was being built and operational,” said WTW’s Tim Egan. “I think it’s the most important thing I’ve done in my career,” he said. “When you get to the core of what we do as risk and insurance professionals, it’s making good and helping restore and being part of that restoration process,” said AIG’s Stratts. “That rebuilding process has been a way to affirm what we do as a profession and also honor the suffering that took place,” he added. “Everybody who is on this placement through not even two or three degrees of separation knows somebody whose name is on that memorial,” Natovitz said. We could all use a novel approach to the presidential campaign — why not treat it like an insurance renewal? Business interruption losses from the Alberta fire will be "massive" according to experts. Weak firewalls for home IoT networks mean your toaster could betray you. Brokers can play a key role in helping insureds get a grip on cyber risk.